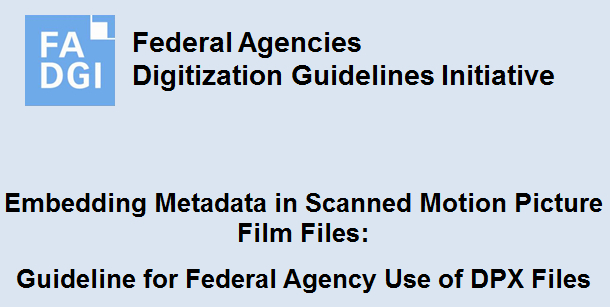 The Federal Agencies Digitization Guidelines Initiative Audio-Visual Working Group is pleased to announce that its new draft publication, Embedding Metadata in Scanned Motion Picture Film Files: Guideline for Federal Agency Use of DPX Files, is available for public comment. The Digital Picture Exchange format typically stores image-only data from scanned motion picture film or born-digital images created by a camera that produces a DPX output. Each DPX file represents a single image or frame in a sequence of a motion picture or video data stream. As a structured raster image format, DPX is intended to carry only picture or imagery data, with corresponding sound carried in a separate format, typically the WAVE format. 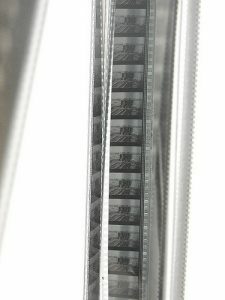 In practice, this means that a single digitized motion picture film will consist of a sequence of tens of thousands of individual DPX files, each file corresponding to a frame of scanned film with sequentially numbered file names, as well as a separate audio file for sound data. Film reel. Photo courtesy of emma.buckley on Flickr. CC BY-ND 2.0. This document is limited in scope to embedded-metadata guidelines and does not look to define other technical characteristics of what a DPX file might carry, including image tonal settings, aspect ratios, bit depths, color models and resolution. Recommended capture settings are defined for a variety of source material in the companion FADGI document, Digitizing Motion Picture Film: Exploration of the Issues and Sample SOW. The new guidelines define FADGI implementations for embedded metadata in DPX file headers, including core fields defined by the SMPTE ST268 family of standards as well as selected fields Strongly Recommended, Recommended or Optional for FADGI use. 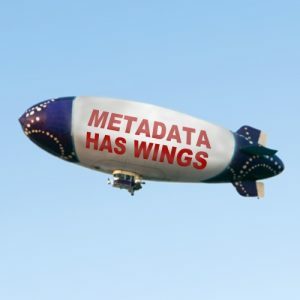 The non-core fields take advantage of existing header structures as well as define new metadata fields for the User Defined fields to document, among other things, digitization-process history. 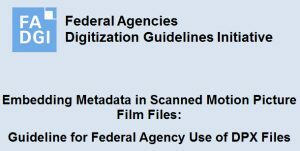 For all metadata fields addressed in this guideline, FADGI has definitions, including those for fields that do not have a definition in SMPTE ST268. For all core fields, the FADGI use complies with the SMPTE use. In non-core fields, especially those with no definition from SMPTE, FADGI defines the use. One example is the Creator field, which FADGI proposes to be used for the name of the institution or entity responsible for the creation, maintenance and preservation of this digital item. This use aligns with other FADGI embedded-metadata guidelines for BWF and MXF AS-07 files. FADGI draws inspiration from the EBU R98-1999: Format for the <CodingHistory> Field in Broadcast Wave Format (PDF) document for defining a use for field 76, User Defined Data Header, to summarize data on the digitizing process, including signal-chain specifics and other elements. 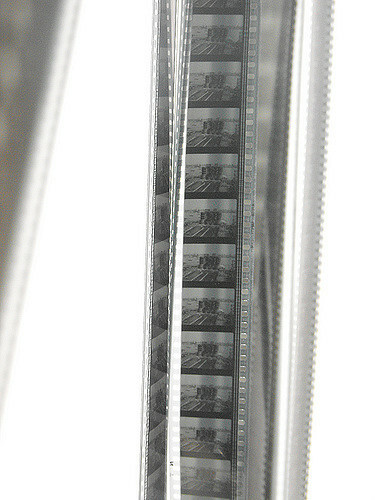 The Digitization Process History field employs a defined string variable for each parameter of the digitization process: the first line documents the source film reel, the second line contains data on the capture process and the third line of data records information on the storage of the file. Initiated in spring 2016, this project is led by the FADGI Film Scanning subgroup with active participation from the Smithsonian’s National Museum of African American History and Culture (NMAAHC), the National Archives and Records Administration (NARA), NASA’s Johnson Space Center and the Library of Congress, including Digital Collections and Management Services, the Packard Campus for Audio-Visual Conservation and the American Folklife Center. The fast pace of this project marks a new work ethos for the always-collaborative FADGI, moving from initial concept to draft publication in under eight months. This iterative nature allows the working group to be more agile in its project management and to get stakeholder feedback early in the project. At the 2016 Association of Moving Images annual conference in Pittsburgh, FADGI members Criss Kovac from NARA and Blake McDowell from NMAAHC presented a well-received poster (PDF) and handout (PDF) on the project. FADGI welcomes comments on the draft guidelines through February 28, 2017. This is a syndicated post. Read the original at The Signal 2016-12-16.